What do we do when two good polls say opposite things? Crikey. You wait months for fresh data and then two big ones come at once. And such is life, they say pretty much opposite things. I’ll get to some proper analysis later, but just for now some first thoughts. Firstly, about the polls. 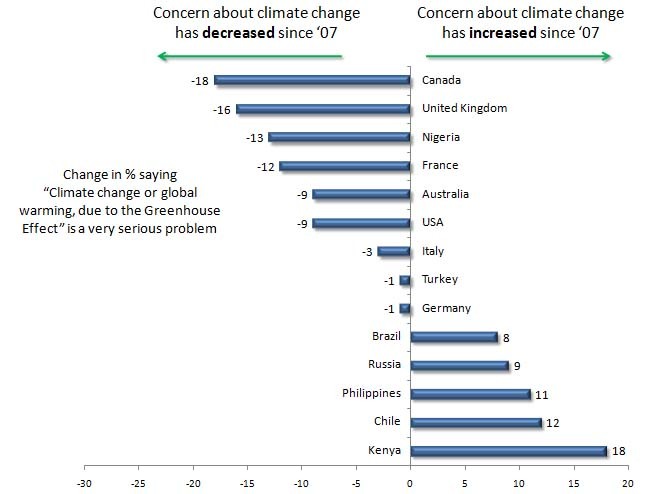 There’s one in the Guardian that apparently shows concern about climate change to be at the same level now as it was in August ’09, i.e. before the UEA emails, the cold winters, Copenhagen, and the relentless stories about how no-one believes in climate change any more. Then, there’s one in the Mail – which is actually reporting ONS data from August last year – that shows that agreement with climate science is lower now than it’s been at any point since ’06 (when the figures begin). As far as I can see, both are reporting the data accurately. There’s no apparent cherry picking, and it looks like the comparisons with previous polls are fair. The Guardian’s reporting stands out for linking directly to both data sets, which I don’t remember ever seeing before – round of applause for Damian Carrington – but the Mail’s doesn’t say anything that I don’t think is justifiable (though it took quite a while to find the data – any reason they couldn’t link to it?). 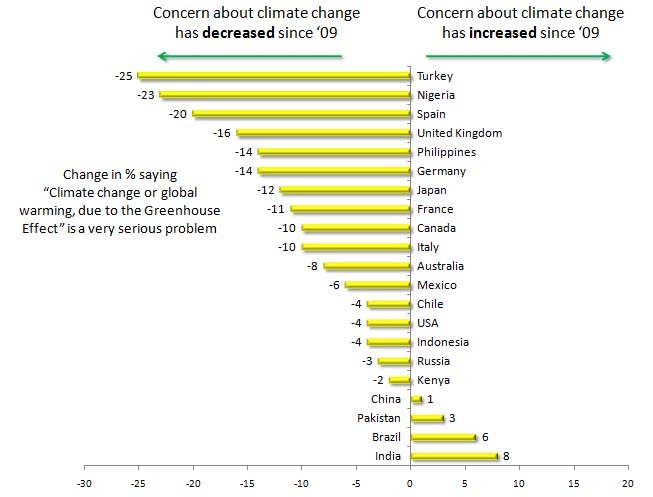 I’ve been saying for a while that the decrease in people saying they’re absolutely convinced that the climate is changing/that global warming is a very big problem may be a factor of the way the ‘debate’ between climate warriors and deniers is being conducted. It’s become so vitriolic that many people are heading for the middle ground, on the assumption that both sides are partly right (or because they’re just sick of it). 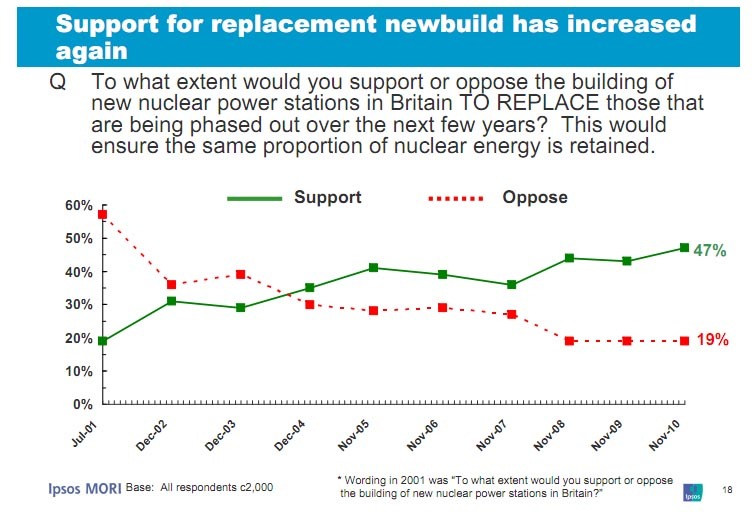 So a question like ONS’s, whose answer choices are “very convinced/fairly convinced/not very convinced/not at all convinced/don’t know” would tend to lose people from the extremes of the scale to the middle (as happens to an extent: 45% in ’06 to 41% now). In contrast, the Guardian’s question was on a discrete scale and didn’t present the contrast between firm opinion vs middle ground (climate change already a threat / will be a threat in the future / not a threat / don’t know). Maybe as a result, there’s less of an effect from the way the debate is being conducted and reported.